Reform Party holds 1st anniversary dinner. Terence Lee. Terence Lee / Pictures by Wallace Woon / Headline picture by Rachel Zeng. EAGER photographers snapped away as leaders from the various opposition parties in Singapore stood together on stage in a display of unity. 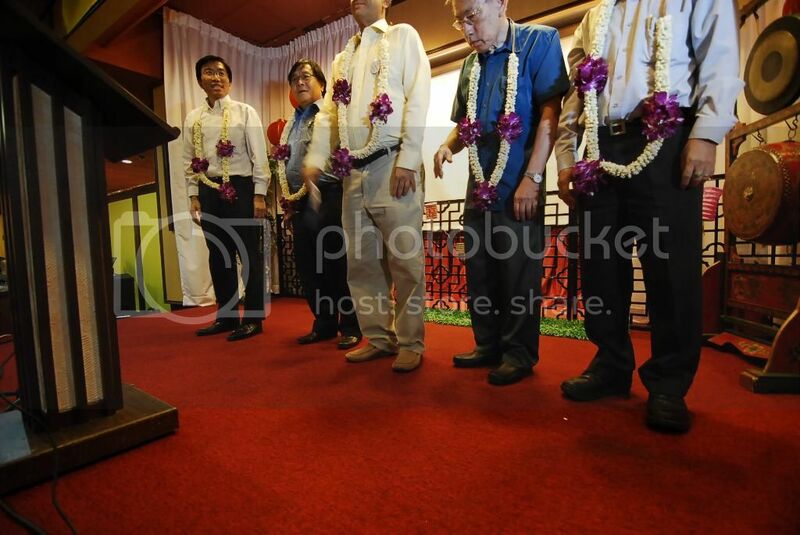 It was all ceremonial – Kenneth Jeyaretnam, Reform Party’s Secretary-General, hung garlands around the other leaders, with Low Thia Khiang from the Worker’s Party (WP) returning the favour at the end. 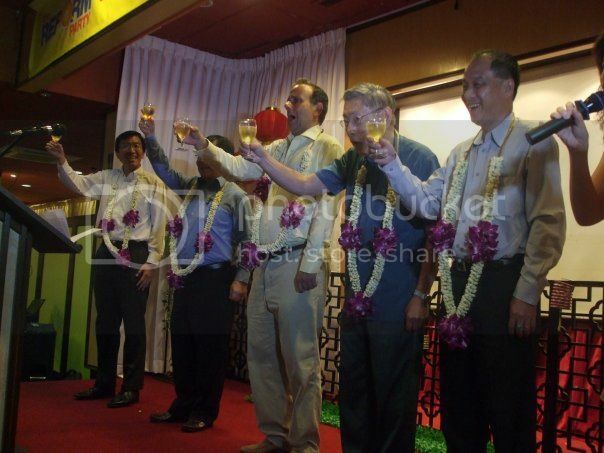 A “toast for democracy” was given – three in total – punctuating the air with spirited cries of “yam seng”. 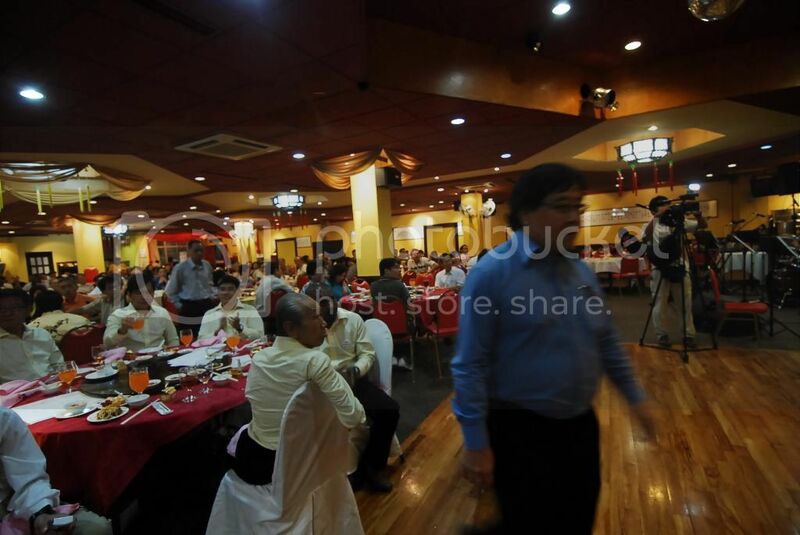 That was the crescendo of the 1st Anniversary Dinner of the Reform Party held at the Fortunate Restaurant yesterday. In an earlier interview with the Kent Ridge Common, Mr Jeyaretnam emphasised the new party’s commitment to unity between the opposition parties. However, it seems like “good relations” is, on the surface, about the furthest the different parties have gone. How deep does the kinship go? Earlier news reports revealed that exploratory talks between Mr Chiam and Mr Jeyaretnam to contest in a GRC together for the next General Elections, had yielded no fruit. Also, when quizzed about whether the Reform Party has had any talks with the WP and the Singapore Democratic Party (SDP), Mr Jeyaretnam was non-committal. He once gain emphasised the good relations between the parties and the common objective which they shared. Past attempts to derive greater opposition unity has similarly been met with inaction. A forum held in February this year by the SDP on the future of opposition politics saw several pleas for greater unified action. SDP Secretary-General Chee Soon Juan surmised four common threads that came out of the forum: the call for a common manifesto, activities, values, and even a website among the various opposition parties in Singapore. However, none of the factions so far, including the Reform Party, has given any indication that any of the above is being considered. Nonetheless, Mr Jeyaretnam took the opportunity during Friday’s to articulate the party’s direction. Pamphlets displaying the party’s vision and beliefs were released. Despite being only 30-member strong, he declared that the Reform Party is ready to participate in the General Elections, although it is unclear whether it will contest in a GRC or SMC. He also took the time to reveal the seven members of the central executive committee to the public. The key appointment holders are 36-year-old Edmund Ng, who acts as the interim chairman, and 50-year-old James Teo, who is the treasurer. The youngest member in the Reform Party’s committee is corporate banker Justin Ong, who is 25 and had just graduated from the National University of Singapore, majoring in political science. He heads the youth wing of the party, which has ten members so far. Besides their active recruiting efforts, the Reform Party is also in the process of getting its newsletter approved by the authorities. Also, it is actively revamping its website, updating its logo, and using Facebook as a tool to reach out to young people. Policy-wise, Mr Jeyaretnam called his party a “liberal, free market, Keynesian party.” By this he meant maintaining a balance between free market principles and active government intervention should the economy slow down. In his speech, he reiterated the party’s emphasis on reform. The GRC system should be abolished, he said, because this results in an unfair representation of alternative voices in Parliament where the opposition in the 2006 General Elections captured one-third of the votes but only slightly more than two percent of the seats. Leveraging on his economics background, he also mentioned in the press conference about allowing citizens to own direct stakes in foreign investments made by Temasek Holdings through shares or direct linkage to the CPF rather than letting the government own the money. Mr Jeyaretnam also called for more individuals to join politics in his speech. Evoking the lessons of the US Civil Rights Movement which eventually led to the election of President Obama as the first black commander-in-chief, he called on Singaporeans to make history happen here. “So Wake Up! Sign Up! Stand Up! 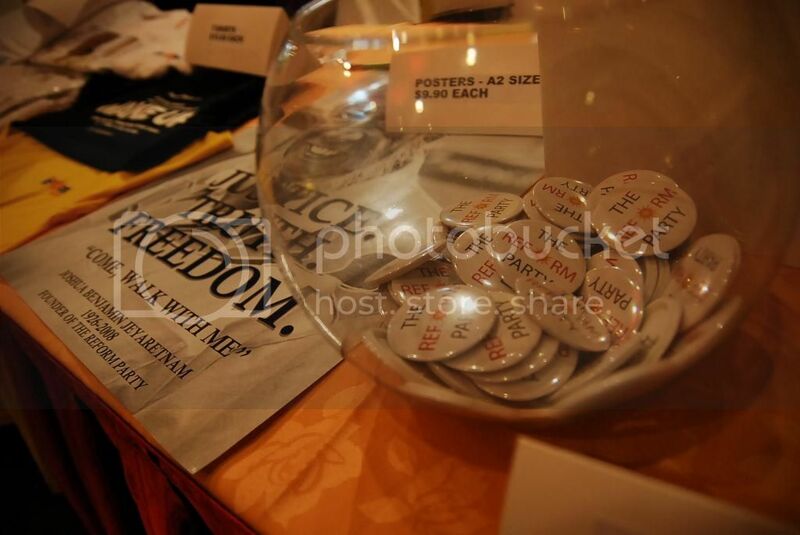 Or at the very least buy a T-shirt!” he said, concluding his speech. Mr Ong was one of those who had answered Mr Jeyaretnam’s call. Having joined the party in May this year, opposition politics was to him a natural first step. He also felt drawn to Mr Jeyaretnam’s economics background. “In Singapore as we know it is all bread and butter politics, and we need a party with a firm stand on economics,” he said. “We are very united. There is solidarity between the parties,” he said, flashing a smile. Read the full text of Mr Jeyaretnam’s speech here.